The big bang paradigm assumes that extragalactic redshifts are mainly cosmological in origin. Thus, high redshift quasars (quasi-stellar objects) are thought to provide a glimpse of the very early universe. However, recent X-ray and radio studies present major problems for this interpretation because such quasars apparently possess large central masses (probably supermassive black holes) and are very similar in elemental composition to much lower redshift quasars. 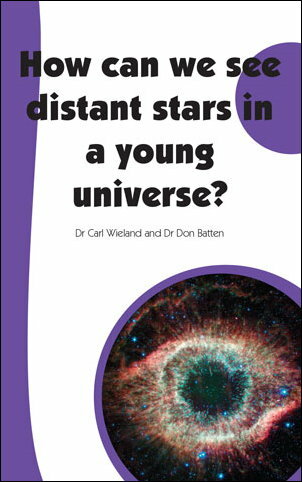 Thus, they appear mature, despite the ‘young’ ages ascribed to them (1 billion years). Furthermore, the length and timing of reionization within the big bang paradigm as deduced from the spectra of the high redshift quasars conflict with figures based on recent Wilkinson Microwave Anisotropy Probe data. These results add to mounting evidence of surprisingly mature high-redshift objects, which is difficult to explain within the big bang paradigm. However, the evidence appears to fit within a creationist cosmological framework. Further investigation of these phenomena may help to develop a model in line with a biblical explanation. Figure 1. 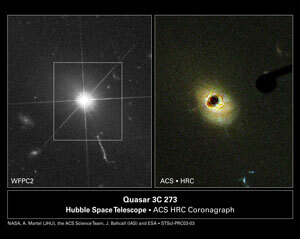 Hubble Space Telescope images of the quasar 3C 273. The left-hand image shows its optical jet, which points roughly toward the five o’clock position. The right-hand image shows its host galaxy; the ACS coronagraph has been used to block out light from the quasar itself. Quasars, or quasi-stellar objects, have provided much fuel for controversy ever since Maarten Schmidt realised in 1963 that the apparently stellar radio source 3C 273 possessed a much higher redshift than any star in the Milky Way galaxy.1 The redshift of 3C 273 is z = 0.158, meaning that the wavelengths of its spectral lines are stretched by 15.8%. Thus, for example, the H beta line of neutral hydrogen, emitted by 3C 273 as blue light at 486.1 nanometres, is observed as green light at 563.2 nanometres.2 If the redshift of 3C 273 is interpreted as a Doppler shift, it must be receding from us at a speed of about 47,000 km/s (kilometres per second). If this figure is reinterpreted as due to the general expansion of the universe with a Hubble constant of 71 km/s per megaparsec, it implies that 3C 273 is about 2 billion light years distant.3 This in turn implies a luminosity in visible light over 1012 (a thousand billion) times that of the Sun—considerably brighter than the entire Milky Way galaxy! Figure 1 reproduces Hubble Space Telescope images of 3C 273 showing its optical jet and its host galaxy respectively. The light source in 3C 273 can vary in intensity on a time scale of a month.2 This means that it cannot be more than about 1 light-month in diameter, since changes in the light generation mechanism cannot be communicated across the source faster than light. This is tiny by galactic standards—one light-month is about one-millionth of the diameter of the Milky Way. In other cases variations are even faster, which implies even smaller light sources. Such small light sources individually producing several galaxies’ worth of light was an unprecedented scenario in the 1960s, and was one reason why several researchers rejected the cosmological interpretation of quasar redshifts. Despite the above problems, quasar redshifts are generally thought to be cosmological in origin, i.e. they are due to the expansion of the universe rather than to any local effects. Thus, considerable effort has been expended in finding and studying the highest-redshift quasars possible, which should also be the most distant. The most recent and comprehensive attempt to do this is represented by the Sloan Digital Sky Survey (SDSS).4 The survey telescope, located at Apache Point Observatory in New Mexico, USA, has a 2.5-metre diameter mirror and uses CCDs (charge-coupled devices) as light detectors and analysers. SDSS is primarily a galaxy survey, but attention has also been given to asteroids, stars and quasars. The spectra of at least 50,000 quasars have now been released into the public domain, including over 5,700 with redshift z exceeding 2.3, and more are expected. Thus SDSS lays claim to most of the highest-redshift quasars discovered to date.5-7 The redshifts of these objects are in the region of z ~ 6, implying that light emitted in the ultraviolet, notably the very strong Lyman alpha (Lyα) hydrogen line at 121.6 nanometres, is observed in the near-infrared. Figure 2. Illustration of how, according to the conventional view, absorption lines in quasar spectra are formed. 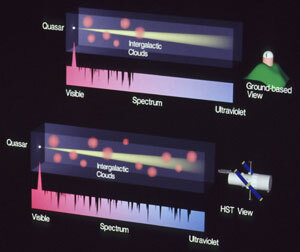 Absorption lines in the far ultraviolet are inaccessible to ground-based telescopes, but are accessible to the Hubble Space Telescope (HST). This gives a fuller picture of the final absorption spectrum than do ground-based telescopes. The particular interest of quasars at such high redshifts is that within the big bang paradigm they are believed to serve as probes of the very early universe, not least because they are the brightest light sources available. 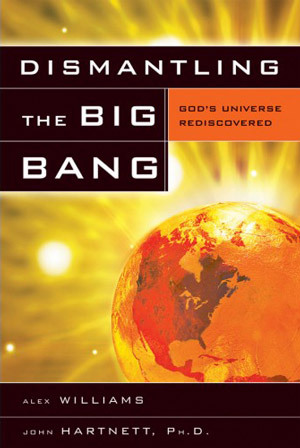 The generally accepted sequence of events within the big bang paradigm is as follows:8 (i) about 400,000 years after the big bang itself, the radiation field had cooled sufficiently to allow atoms (mostly hydrogen) to form. Thus the universe became largely opaque to radiation. The cosmic background radiation we now observe is thought to have originated at this time; (ii) over the next few hundred million years stars and galaxies formed, the most massive stars completing their life cycles and exploding as supernovae; (iii) once enough hot, bright stars had formed, they produced copious amounts of ultraviolet light which ionized the majority of atoms in intergalactic space. This ‘cleared the fog’ of atoms that had formed earlier and the universe again became largely transparent to radiation. This stage, known as the reionization epoch, is very important to astronomers seeking to ascertain the detailed history of the early universe. How can high-redshift quasars probe the reionization epoch? If quasar light passes through intervening hydrogen clouds at lower redshifts, it will be absorbed at wavelengths corresponding to quantum transitions in hydrogen atoms in the clouds, producing dips or absorption lines in the observed quasar spectrum. Figure 2 illustrates this effect. The most important absorption is due to the Lyα transition, in which the hydrogen atom’s electron jumps from its ground state to its first excited state. 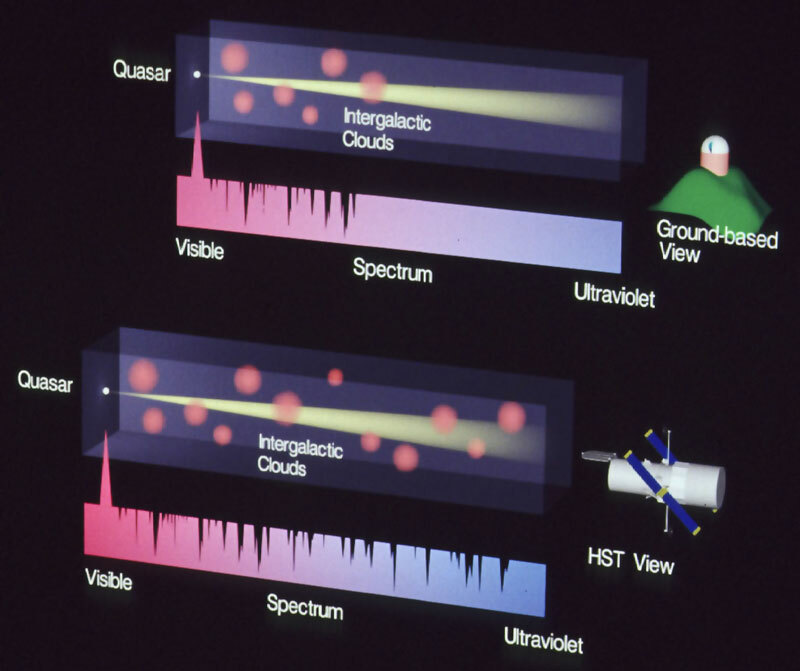 However this is observed, not in the ultraviolet, but at a wavelength corresponding to the redshift of the absorbing cloud, which generally shifts it into the visible or infrared. If the absorbing material covers considerable total depth along the line of sight, a large portion of the quasar’s spectrum on the short-wavelength side of its Lyα emission peak (which is usually very prominent) will be missing. This is known as the Gunn-Peterson effect.9 If instead there are numerous small absorbing regions, the quasar’s spectrum will contain many narrow Lyα absorption lines; this is known as a Lyman alpha forest. The Gunn-Peterson effect is recognised as a signature of intergalactic neutral hydrogen. However, Gunn and Peterson noted that, contrary to expectations, no such effect was visible in the spectrum of a z = 2 quasar, allowing them to place a stringent upper limit on the amount of neutral hydrogen in the intervening region of space. This remained the case for all quasars discovered prior to SDSS, implying that intergalactic hydrogen is practically all ionized up to a very high redshift. However, from about 2001 SDSS began to turn up quasars with z ~ 6, which did indeed show a Gunn-Peterson trough in their spectra. Thus, a redshift of about 6 seems to relate to the reionization epoch (again within the big bang paradigm). A quasar is generally understood as being the extremely energetic core of an active galaxy containing a supermassive black hole. Its prodigious energy output is supposedly fuelled by accretion onto the black hole. Since z ~ 6 is about the earliest epoch at which galaxies can be seen, observations of the quasars present at the time should yield important information about the galaxy formation process as well as the general state of the universe. Hence, these quasars, as well as probing the reionization epoch, are of special interest in their own right. However, recent X-ray and radio studies of three such quasars have shown quite unexpected results. We describe these in turn in the next two sections and their relevance for the big bang paradigm. Figure 3. 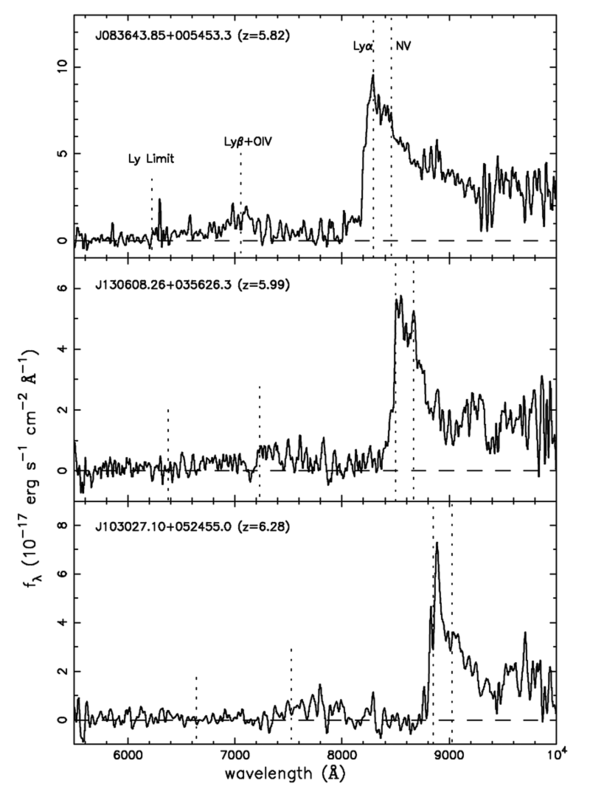 SDSS visible/infrared spectra of three quasars discussed by Becker et al14 (from Fan, X. et al).5 The highest peaks in these spectra correspond to redshifted Lyα emission. Farrah et al.10 observed the radio-quiet quasar SDSS J1030+0524 (hereafter J1030; its redshift is z = 6.30) for about 29 hours using the orbiting ESA/NASA X-ray observatory XMM-Newton. The results they present cover the energy range 0.3-12 keV (kilo electron volts). Although Farrah et al. recognise that their data are of relatively low quality, they find that a power-law curve of X-ray flux (in units of photons cm–2 s–1 keV–1) against energy fits quite well. They note a slightly raised flux in the 0.9-1.0 keV range, which they attribute to a possible series of iron emission lines centred on 6.7 keV in the J1030 rest frame. This result falls well within the range of X-ray spectral indices of a number of lower-redshift quasars observed by Reeves and Turner,11 especially the radio-quiet portion (27 out of 62) of their sample. Before considering the possible significance of these findings, we note a few other features of J1030. It shows no evidence of significant gravitational lensing effects,12 nor of ‘beaming’ (i.e. it does not possess an energetic jet or beam pointing towards us).13 Becker et al.14 claim that its spectrum has a definite Gunn-Peterson absorption trough in the near infrared. It also contains material with metallicity15 equal to or exceeding solar values,16,17 and there is indirect evidence of a host galaxy.18 The Gunn-Peterson trough was hailed by Becker et al. as indicating that J1030 was at least partially covered by neutral hydrogen and that it lay somewhere within the reionization epoch; quasars with slightly lower redshift (z = 5.82 and z = 5.99) did not show clear evidence of this feature. The relevant spectra are shown in figure 3. At the same time however, J1030 has several features in common with quasars at much lower redshift: its high metallicity, its massive host galaxy, and especially its X-ray spectrum. Indeed Farrah et al. regard it as inherently indistinguishable from lower-redshift quasars in general. In the conventional paradigm, quasars result from the formation of massive, chemically mature galaxies hosting supermassive black holes that accrete the mass of infalling gas and stars. Most astrophysicists would wish to allow billions of years for such structures to develop, but Farrah et al. estimate the age of J1030 to be ‘only’ 860 million years. They regard this result as ‘surprising’, and wanting explanation within the ΛCDM (i.e. dark energy/cold dark matter) paradigm. Schwartz and Virani19 observed the radio-quiet quasar SDSSp J130608.26+035626.3 (hereafter J1306, redshift z = 5.99) for about 33 hours using the ACIS-S instrument aboard the Chandra orbiting X-ray observatory; its SDSS discovery image is reproduced in figure 4. 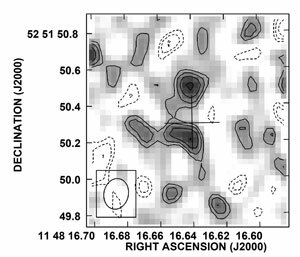 Schwartz and Virani’s observations cover its X-ray spectrum in the range 0.5-7 keV, corresponding to 3.5-49 keV in the quasar rest frame. The main difference between XMM-Newton and Chandra is that the latter is less sensitive but has finer spatial resolution, such that the precise origin of the observed X-ray flux is more certain. However, the results for J1306 are essentially the same: it has a very similar X-ray spectrum, with slightly increased flux at an energy of 0.916 keV, which could be a redshifted 6.7 keV iron emission line. The main point is that, as for J1030, J1306 has an X-ray spectrum very similar to other radio-quiet quasars at lower redshifts, and probably has high metallicity. Within the conventional paradigm, this implies the formation of a massive, chemically mature galaxy hosting a supermassive black hole within a billion years of the big bang. Schwartz and Virani quote the results of spectroscopic investigations of other high-redshift quasars (z ≥ 5.7) indicating the presence of magnesium, silicon, carbon and iron17,20 again underlining the strong similarities between radio-quiet quasars right through the range of redshifts up to 6.4. The only difference of note between J1030 and J1306 is that the latter does not exhibit a complete Gunn-Peterson absorption trough in its near-infrared spectrum,21 but the relevant authors attribute this to the cosmic environment rather than to the quasars themselves. Walter et al.22 observed the z = 6.42 quasar SDSS J114816.64+525150.3 (hereafter J1148), currently the highest-redshift quasar known, for about 60 hours in total. They used the VLA (Very Large Array) at Socorro in New Mexico, working in a series of narrow-band channels around a frequency of 46.6 GHz (6.43 mm wavelength); this corresponds to a redshifted carbon monoxide emission line with a rest-frame frequency of 345.8 GHz. Different VLA configurations were used, the highest spatial resolution achieved being 0.17”×0.13” (i.e. arcsecond2). At this resolution, the source was clearly extended; indeed the emission map has two maxima as shown in figure 5. Molecular gas thus extends to a radius of 0.42”, corresponding to about 2.5 kiloparsecs (8,000 light years) if a cosmological redshift and standard cosmological model parameters are assumed. Figure 4. SDSS infrared z-band finder image for J1306 (from Fan, X. et al).5 The quasar has a z-band magnitude of 19.5. Note that the field is less than 3 arcseconds across; for comparison, the typical resolution limit of a backyard telescope is around 1 arcsecond. The velocity of rotation of the molecular gas deduced from the observed width of the radio emission lines is about 280 km/s. Assuming that the gas is gravitationally bound, Walter et al. infer an associated dynamical mass of around 50 billion solar masses. This is of the same order as the mass of hydrogen present as indicated by the quasar’s radio flux.23 Infrared spectroscopy has been used to deduce a black hole mass at the centre of the quasar of 3±2 billion solar masses,24 i.e. between 2% and 10% of the estimated dynamical mass. These results present a conundrum for the generally accepted picture of galaxy formation. There is a well-established correlation between the total mass of a galaxy’s central stellar bulge25 and the mass of the black hole thought to reside at its centre. This is known as the Magorrian relation, after one of the leading scientists who discovered it.26,27 Astrophysicists understand this relationship to imply that galaxy formation and central black hole formation are closely linked processes, whereas previously they had been viewed as quite separate. The original correlation has now been replaced by an even tighter correlation between MBH , the black hole mass, and σbulge , the velocity dispersion of the stars in the bulge,28 both of which are obtained spectroscopically.29,30 According to Walter et al., this relation predicts that several trillion (1012 ) solar masses should be present in the J1148 host galaxy, far more than they infer from their data. Even a conservative approach based on different assumptions predicts that the bulge mass should be several times greater than the data allows. The conclusion drawn by Walter et al. is that ‘… black holes may assemble before the stellar bulges. This would be in conflict with the popular picture of coeval evolution of the central black hole and stellar bulge.’22 Note that this ‘popular picture’ had only become mainstream from the discovery of the Magorrian relation less than a decade ago. Thus, the J1148 host galaxy appears very different from lower-redshift galaxies that follow the present-day Magorrian relation, yet Barth et al.20 have noted that its iron/magnesium ratio, which is used as a rough age indicator, is similar to the value found in many lower-redshift quasars. This result is certainly paradoxical for the conventional paradigm: J1148, whilst being ‘only’ 870 million years old,22 has synthesized numerous elements including the alpha elements31 and iron to the same degree as other, much older systems, yet its stellar population, if indeed such exists, has an insignificant mass. Furthermore, it appears to possess a much more massive central black hole than expected from its dynamical mass. Figure 5. Highest-resolution carbon monoxide emission map of J1148 (from Walter et al).22 The field is just over 1 arcsecond square. The resolution is approximately 0.1 arcsecond, indicated by the rectangle and contained ellipse at the bottom left. Becker et al.32 present four quasars, including J1306 and J1030, as displaying a steadily increasing degree of Gunn-Peterson absorption with increasing redshift, just as expected if reionization was completed fairly universally at a redshift close to 6. However, this apparent support for the conventional paradigm is controversial. When combined, the studies of J1148 and J1030 by White et al.33 and by Oh and Furlanetto34 suggest that reionization is somewhat patchy. Furthermore, a study by Malhotra and Rhoads35 of galaxies in the redshift range 5.7–6.5 suggests that reionization was practically complete at z ≈ 6.5, i.e. somewhat earlier than suggested by the quasar data. Analysis by Kogut et al36 of WMAP (Wilkinson Microwave Anisotropy Probe) data on the Cosmic Microwave radiation implies that if reionization was a simple single-step process, then it must have been completed at a much higher redshift, z = 17±3. The redshift values at which reionization took place as deduced from the quasar, galaxy and WMAP data are thus in conflict. Reconciliation has been approached by more complex models than the simple one assumed by Kogut et al.,39 e.g. the two-stage model of Cen.37 However, this depends heavily on the assumed existence and properties of Population III stars, which have never been observed.38 In particular, Cen assumes a top-heavy initial mass function, i.e. the first stellar populations would have contained a large proportion of very massive stars. 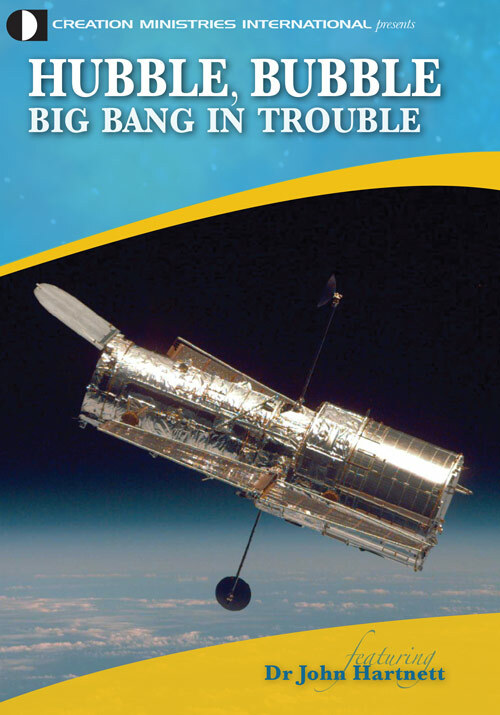 Unfortunately, most of Cen’s predictions cannot be tested without future generations of telescopes. Ironically, he predicts that no Population III stars will ever be found; the very objects whose prior existence is essential to his model would, if they turned up, invalidate the model! We conclude that within a conventional big bang cosmology the apparently conflicting reionization data can only be reconciled through a very speculative theoretical model. Ironically, he predicts that no Population III stars will ever be found; the very objects whose prior existence is essential to his model would, if they turned up, invalidate the model! These discoveries, together with the maturity of the three high-redshift quasars discussed earlier, severely challenge the credibility of the big bang paradigm. However, this raises two obvious questions: is there an alternative paradigm into which the observations fit more easily? 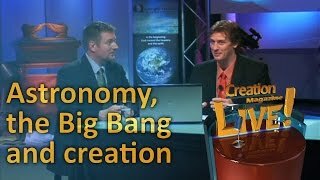 And how can these observations help develop a cosmology consistent with the Genesis record of creation? Following Arp,46,47 Hartnett48 has suggested that quasars are ejected, often in pairs, from the centres of active galaxies, and may subsequently evolve into galaxies. In such a picture, quasar redshifts are not cosmological but are largely intrinsic, decreasing as time passes. Hartnett thus implies that quasars are much closer than usually supposed, their high redshifts being a signature of the way they were created. While Arp believes that the universe is not expanding, his observations do not necessarily demand this conclusion. Indeed radio astronomer Morley Bell accepts the evidence for ejection from galaxies and for decreasing intrinsic redshifts in quasars, but also finds evidence that the universe is expanding.49-51 From a biblical viewpoint it seems most likely, as Humphreys52 has argued, that the universe has expanded since the initial moment of its creation; Bell’s findings are consistent with this view. In sharp contrast with the big bang paradigm, however, Humphreys proposes a bounded and essentially geocentric universe. Can high-redshift quasars be fitted into a Hartnett-Bell type of universe in which they would be much smaller, less massive and less luminous than usually supposed? This might at first seem unlikely, since quasars show a Lyα absorption forest that generally increases in complexity with redshift, an effect usually interpreted in terms of hydrogen clouds within hypothetical intervening galaxies (see figure 2 again). However, searches for light emitted from such galaxies have proved remarkably fruitless,53 suggesting that the quasars may be relatively nearby and that gas local to the quasars causes the Lyα absorption. Quasars ejecting gas clouds that intersect our line of sight would produce series of absorption features at redshifts below their own, just as observed. It has been claimed54 that the phenomenon of increasing numbers of Lyα absorption lines with redshift discriminates strongly against the ‘local quasars’ concept. However, such claims ignore possible alternatives to the standard ‘accreting black hole’ model of quasars, and in particular, the possible reduction in quasar activity from an initially very high level as its intrinsic redshift declines. Bell51 quotes further evidence that quasars may be relatively nearby, viz. (1) Lyα absorption forests have not ‘convincingly’ been found in the spectra of normal galaxies, and (2) the metallicity of the Lyα absorbers associated with quasars varies remarkably little with redshift;55,56 this is to be expected in a ‘local’ model for quasars, but is very puzzling if quasar redshifts are cosmological since the assumed intervening galaxies should evolve chemically with time. Furthermore, this lack of metallicity variation with redshift mirrors the lack of metallicity variation noted earlier with respect to the quasars themselves, just as expected if the absorption takes place locally. Schmidt, M., 3C 273: a star-like object with a large red-shift, Nature 197:1040, 1963. Return to Text. Greenstein, J.L. and Schmidt, M., The quasi-stellar radio sources 3C 48 and 3C 273, Ap.J. 140(1):1–34, 1964. Return to Text. For such calculations a series of handy ‘cosmology calculators’ is available through links on the NASA/IPAC web page at: nedwww.ipac.caltech.edu/help/cosmology_calc.html, 24 May 2005. Return to Text. Details of SDSS can be found on the survey home page at: www.sdss.org/, 21 February 2005. Return to Text. Fan, X., Narayanan, V.K., Lupton, R.H. et al., A survey of z>5.8 quasars in the Sloan Digital Sky Survey I: discovery of three new quasars and the spatial density of luminous quasars at z~6, arXiv:astro-ph/0108063, 30 November 2004. Return to Text. Fan, X., Strauss, M.A., Schneider, D.P. et al., A survey of z>5.7 quasars in the Sloan Digital Sky Survey II: discovery of three additional quasars at z>6, arXiv:astro-ph/0301135, 23 February 2005. Return to Text. Fan, X., Hennawi, J.F., Richards, G.T. et al., A survey of z>5.7 quasars in the Sloan Digital Sky Survey III: discovery of five additional quasars, arXiv:astro-ph/0405138, 23 February 2005. Return to Text. See, for example, Schwarzschild, B., Spectra of the most distant quasars elucidate the reionization of the Cosmos, Physics Today Search & Discovery, www.physicstoday.org/pt/vol-54/iss-10/p17.html, 27 May 2005. Return to Text. Gunn, J.E. and Peterson, B.A., On the density of neutral hydrogen in intergalactic space, Ap. J. 142:1633–1636, 1965. Return to Text. Farrah, D., Priddey, R., Wilman, R., Haehnelt, M. and McMahon, R., The X-ray spectrum of the z = 6.30 QSO J1030+0524, arXiv:astro-ph/0406561, 2 March 2005. Peer-reviewed version: Ap. J. 611(1):L13–L16, 2004. Return to Text. Reeves, J.N. and Turner, M.J.L., X-ray spectra of a large sample of quasars with ASCA, arXiv:astro-ph/0003080, 2 March 2005. Peer-reviewed version: Mon. Not. Roy. Astr. Soc. 316(2):234–248, 2000. Return to Text. Richards, G.T., Strauss, M.A., Pindor, B. et al., A snapshot survey for gravitational lenses among z>=4.0 quasars: I. 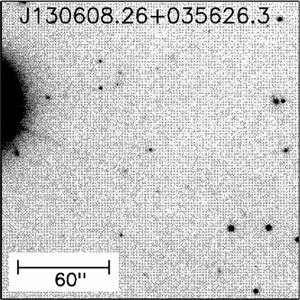 The z>5.7 sample, arXiv:astro-ph/0309274, 2 March 2005. Peer-reviewed version: Astron. J. 127:1305–1312, 2004. Return to Text. Haiman, Z. and Cen, R., A constraint on the gravitational lensing magnification and age of the redshift z=6.28 quasar SDSS 1030+524, arXiv:astro-ph/0205143, 2 March 2005. Peer-reviewed version: Ap. J. 578(2):702–707, 2002. Return to Text. Becker, R.H., Fan, X., White, R.L. et al., Evidence for reionization at z~6: detection of a Gunn-Peterson Trough in a z=6.28 quasar, Astron. J. 122(6):2850–2857, 2001. Return to Text. In this case metallicity is defined in terms of the iron/magnesium ratio, and is taken to be a measure of the degree of processing which the observed material has undergone in the cores of massive stars. Return to Text. Pentericci, L., Fan, X., Rix, H.-W. et al., VLT optical and near-infrared observations of the z=6.28 quasar SDSS J1030+524, arXiv:astro-ph/0112075, 3 March 2005. Peer-reviewed version: Astron. J. 123(5):2151–2158, 2002. Return to Text. Freudling, W., Corbin, M.R. and Korista, K.T., Iron emission in z~6 QSOs, arXiv:astro-ph/0303424, 3 March 2005. Peer-reviewed version: Ap. J. 587(2):L67–L70, 2003. Return to Text. Barkana, R. and Loeb, A., Spectral signature of cosmological infall of gas around the first quasars, arXiv:astro-ph/0209515, 3 March 2005. Peer-reviewed version: Nature 421(6921):341–343, 2003. Return to Text. Schwartz, D.A. and Virani, S.N., Chandra measurement of the X-ray spectrum of a quasar at z=5.99, arXiv:astro-ph/0410124, 16 November 2004. Peer-reviewed version: Ap. J. 615(1):L21–L24, 2004. Return to Text. Barth, J.A., Martini, P., Nelson, C.H. 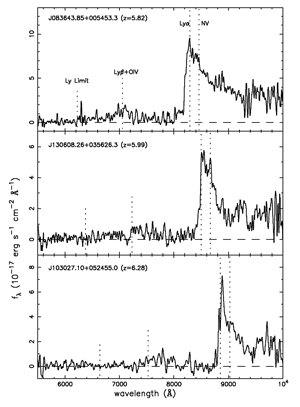 and Ho, L.C., Iron emission in the z=6.4 quasar SDSS J114816.64+525150.3, Ap. J. 594(2):L95–L98, 2003. Return to Text. Becker, et al., ref. 14, actually compare the spectra of these two quasars directly. Return to Text. Walter, F., Carilli, C., Bertoldi, F., Menten, K., Cox, P., Lo, K.Y., Fan, X. and Strauss, M.A., Resolved molecular gas in a quasar host galaxy at redshift z=6.42, arXiv:astro-ph/0410229, 16 November 2004. Peer-reviewed version: Ap. J. 615(1):L17–L20, 2004. Return to Text. Walter, F., Bertoldi, F., Carilli, C., Cox, P., Lo, K.Y., Neri, R., Fan, X., Omont, A., Strauss, M.A. and Menten, K.M., Molecular gas in the host galaxy of a quasar at redshift z = 6.42, Nature 424(6947):406–408, 2003. Return to Text. Willott, C.J., McLure, R.J. and Jarvis, M.J., A 3×109 solar mass black hole in the quasar SDSS J1148+5251 at z = 6.41, Ap. J. 587(1):L15–L18, 2003 Return to Text. In the case of an elliptical galaxy this includes the whole galaxy, whereas in a spiral it excludes the spiral arms. Return to Text. Magorrian, J., Tremaine, S., Richstone, D., Bender, R., Bower, G., Dressler, A., Faber, S.M., Gebhardt, K., Green, R., Grillmair, C., Kormendy, J. and Lauer, T., The demography of massive dark objects in galaxy centres, Astron. J. 115:2285–2305, 1998. Return to Text. Richstone, D., Ajhar, E.A., Bender, R., Bower, G., Dressler, A., Faber, S.M., Filippenko, A.V., Gebhardt, K., Green, R., Ho, L.C., Kormendy, J., Lauer, T.R., Magorrian, J. and Tremaine, S., Supermassive black holes and the evolution of galaxies, arXiv:astro-ph/9810378. 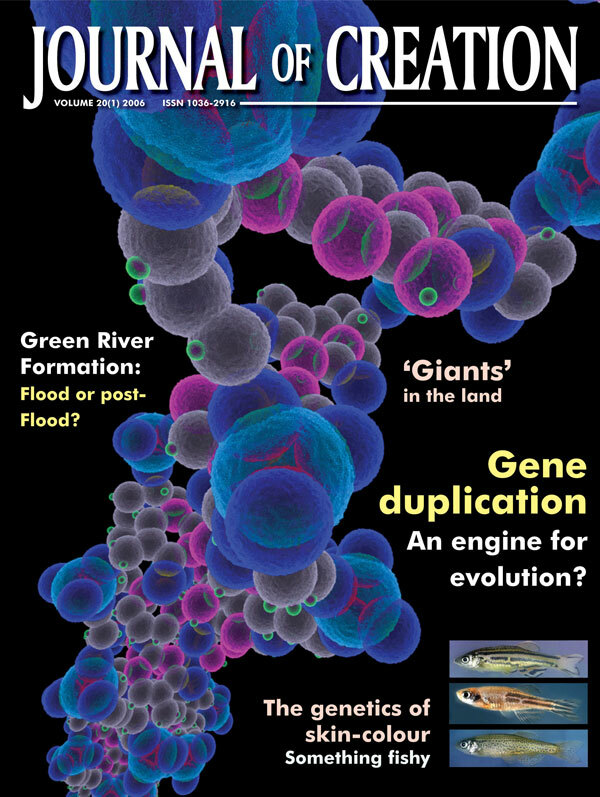 Peer-reviewed version: Nature 395:A14–A19, 1998. Return to Text. Note that in this context velocity dispersion is a measure of mass. Return to Text. Ferrarese, L. and Merritt, D., A fundamental relation between supermassive black holes and their host galaxies, Ap. J. 539(1):L9–L12, 2000. Return to Text. Gebhardt, K., Bender, R., Bower, G., Dressler, A., Faber, S.M., Filippenko, A.V., Green, R., Grillmair, C., Ho, L.C., Kormendy, J., Lauer, T.R., Magorrian, J., Pinkney, J., Richstone, D. and Tremaine, S., A relationship between nuclear black hole mass and galaxy velocity dispersion, Ap. J. 539(1):L13–L16, 2000. Return to Text. The alpha elements have atomic numbers Z > 22, and follow a sequence of multiples of helium, i.e. Mg, Si, S, Ar, Ca; sometimes Ti is also included. They are thought to be formed by successive alpha-particle captures within Type 2 (core-collapse) supernovae starting with C and O. See Cassé, M., Stellar Alchemy: The Celestial Origin of Atoms, Cambridge University Press, 2003. Return to Text. Becker et al., ref. 14, figures 1 and 2. Return to Text. White, R.L., Becker, R.H., Fan, X. and Strauss, M.A., Probing the ionization state of the universe at z > 6, arXiv:astro-ph/0303476, 15 April 2005. Peer-reviewed version: Astron. J. 126:1–14, 2003. Return to Text. Oh, S.P. and Furlanetto, S.R., How universal is the Gunn-Peterson Trough at z~6? A closer look at the quasar SDSS J1148+5251, astro-ph/0411152, 12 April 2005. Peer-reviewed version: Ap. J. 620(1):L9–L12, 2005. Return to Text. Malhotra, S. and Rhoads, J.E., Luminosity functions of Lyman-alpha emitters at redshift z=6.5 and z=5.7: evidence against reionization at z≈6, arXiv:astro-ph/0407408, 3 May 2005. Peer-reviewed version: Ap. J. 617(1):L5–L8, 2004. Return to Text. Kogut, A., Spergel, D.N., Barnes, C. et al., First-year Wilkinson Microwave Anisotropy Probe (WMAP) observations: temperature-polarization correlation, Ap. J. S. S. 148(1):161–173, 2003. Return to Text. Cen, R., The universe was reionized twice, arXiv:astro-ph/0210473, 3 May 2005. Peer-reviewed version: Ap. J. 591(1):12–37, 2003. Return to Text. Houck, J.R., Soifer, B.T., Weedman, D. et al., Spectroscopic redshifts to z>2 for optically obscured sources discovered with the Spitzer space telescope, arXiv:astro-ph/0502216, 10 May 2005. Peer-reviewed version: Ap. J. 622(2):L105–L108, 2005. Return to Text. Labbé, I., Huang, J., Franx, M. et al., IRAC mid-infrared imaging of the Hubble Deep Field-South: Star formation histories and stellar masses of red galaxies at z>2, arXiv:astro-ph/0504219, 10 May 2005. Peer-reviewed version: Ap. J. 624(2):L81–L84, 2005. Return to Text. Lisle, J., Distant large galaxies with ‘old’ stars—another unpleasant surprise for big bang supporters, Journal of Creation 19(3):3, 2005. Return to Text. Eyles, L.P., Bunker, A.J., Stanway, E.R., Lacy, M., Ellis, R.S. and Doherty, M., Spitzer imaging of i’-drop galaxies: old stars at z≈6, arXiv:astro-ph/0502385, 6 April 2005. Peer-reviewed version: MNRAS 364(2):443–454, 2005. Return to Text. Mobasher, B., Dickinson, M, Ferguson, H.C. et al., Evidence for a massive post-starburst galaxy at z~6.5, arXiv:astro-ph/0509768, 8 December 2005. Return to Text. Mullis, C.R., Rosati, P., Lamer, G., Böhringer, H., Schwope, A., Schuecker, P. and Fassbender, R., Discovery of an X-Ray-luminous galaxy cluster at z=1.4, arXiv:astro-ph/0503004, 8 March 2005. Peer-reviewed version: Ap. J. 623(2):L85–L88, 2005. Return to Text. Arp, H., Quasars, Redshifts and Controversies, Interstellar Media, 1987. Return to Text. Arp, H., Seeing Red: Redshifts, Cosmology and Academic Science, Apeiron, Montreal, 1998. Return to Text. Hartnett, J.G., Quantized quasar redshifts in a creationist cosmology, Journal of Creation 18(2):105–113, 2004 Return to Text. Bell, M.B., Further evidence for large intrinsic redshifts, Ap. J. 566(2):705–711, 2002 Return to Text. Bell, M.B., On quasar distances and lifetimes in a local model, Ap. J. 567(2):801–810, 2002. Return to Text. Bell, M.B., Distances of quasars and quasar-like galaxies: further evidence that quasi-stellar objects may be ejected from active galaxies, arXiv:astro-ph/0409025, January 2005. Peer-reviewed version: Ap. J. 616(2): 738–744, 2004. Return to Text. 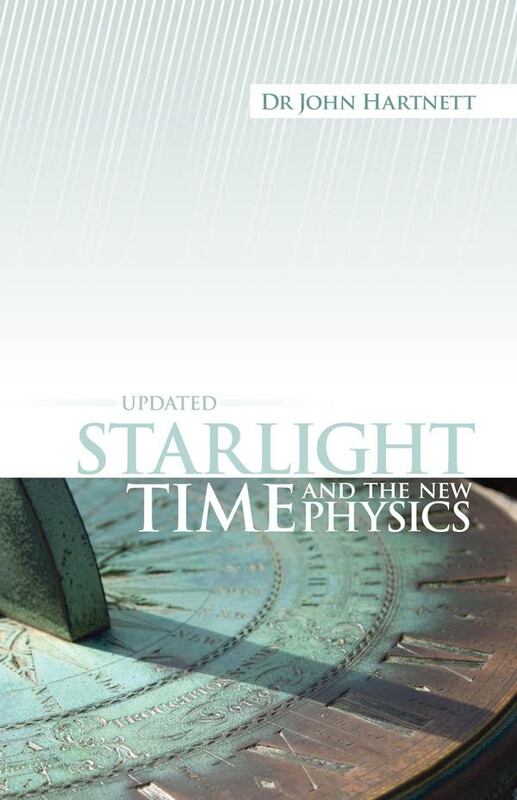 Humphreys, D.R., Starlight and Time: Solving the Puzzle of Distant Starlight in a Young Universe, Master Books, Green Forest, AR, 1994. Return to Text. Colbert, J.W. and Malkan, M.A., NICMOS snapshot survey of damped Lyman α quasars, arXiv:astro-ph/0112416, 19 May 2005. Peer-reviewed version: Ap. J. 566(1):51–67, 2002. Return to Text. See, for example, Cramer, J.G., A stroll through the Lyman-Alpha forest! www.freerepublic.com/focus/f-news/1081437/posts, or the ‘Bad Astronomy Bulletin Board’ at www.badastronomy.com/phpBB/viewtopic.php?t=3520, both 25 May 2005. Return to Text. Prochaska, J.X. and Wolfe, A.M., The UCSD HIRES/Keck I damped Lyα abundance database. II. The implications, arXiv:astro-ph/0110351, 20 May 2005. Peer-reviewed version: Ap. J. 566(1):68–92, 2002. Return to Text. Prochaska, J.X., The chemical uniformity of high-z damped Lyα protogalaxies, arXiv:astro-ph/0209193, 20 May 2005. Peer-reviewed version: Ap. J. 582(1):49–59, 2003. Return to Text. See, for example, Arp, H., Catalogue of Discordant Redshift Associations, Apeiron, Montreal, 2003. Return to Text. See Hartnett, ref. 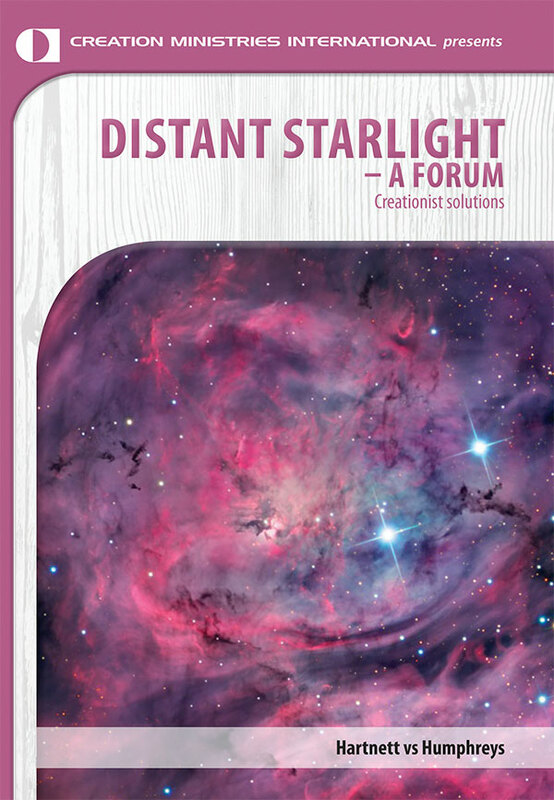 48, and the series of Journal of Creation articles beginning with: Hartnett, J.G., A creationist cosmology in a galactocentric universe, Journal of Creation 19(1):73–81, 2005. Return to Text.